In the town of Bevier, Missouri, where my grandparents lived, there stands a big historic “mansion” on Bloomington Street. 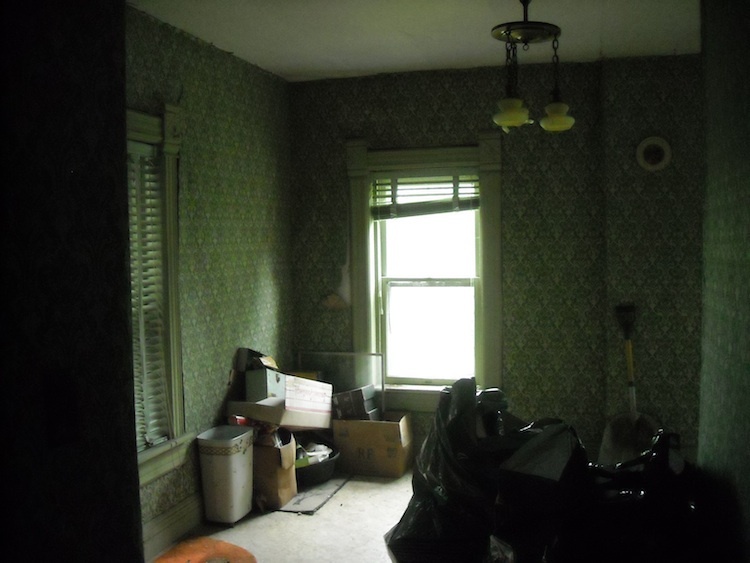 As long as I can remember, I’ve wanted to see inside this house, but never had the opportunity. 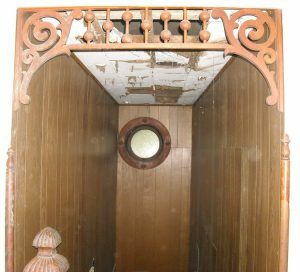 It’s been standing empty for years, owned by an auction company, decaying from neglect and the harsh effects of weather and any number of wild critters who found their way inside. My sister’s friend, Krista, and her husband, just bought it! The house has an amazing history, built around the mid 1800’s by a doctor. Three layers of brick in the walls – built to withstand a blast from a cannon. Lived in by a coal tycoon, who was murdered (but not IN the house, although there are bullet marks in the front of the house from some of the death threats prior to his final demise). 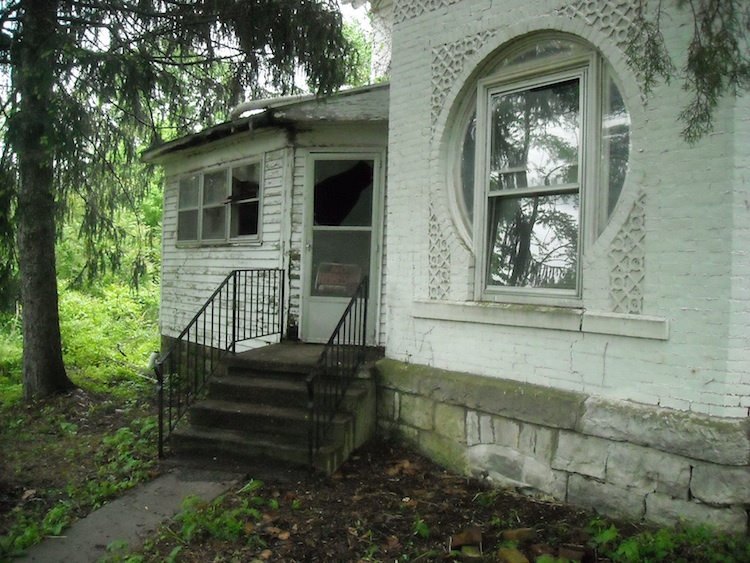 In its last livable days, it was used as a nursing home and called a “Boarding House” by a lady named Marie LaSalle. Oh, the stories this house could tell! I’ll take you on a tour . . . it’s amazing. The fireplace to the left upon first entering the house — what might be called the parlor, I guess? Mirror, tile, fancy woodwork, and look at the cover there resting up against it. Fancy! One of those round windows you can see from the outside. How cool is this? And you can see the brick wall exposed. Standing in the sitting room — haha — looking into another room . . . the living room, maybe? There are so many rooms, I don’t know what to call each of them. That far door hides a powder room. 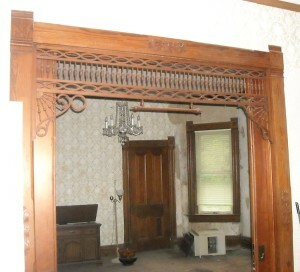 Look at the woodwork in the doorway. And yes, those are double pocket doors! I’m swooning . . .
Another pocket door with fancy woodwork. 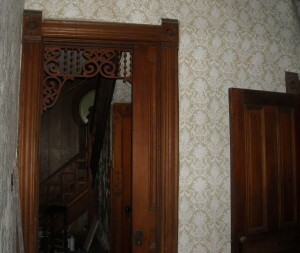 The doorway you can see on the right goes into the dining room. I didn’t get a picture of the dining room, for some reason, but it has a HUGE bay window, and a built-in massive china cabinet with glass doors. There’s also a servant’s entrance in the corner of this room, so they didn’t have to go out and around from the kitchen. So maybe this is the dining room? I can’t tell. When the house was vacated, everything was left just as it was. 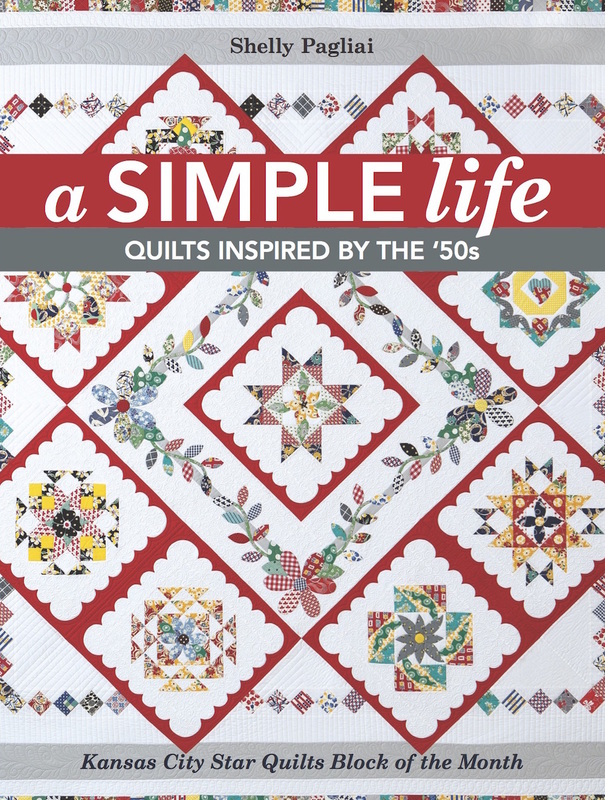 Clothes, books, furniture, dishes, personal papers, all the sundries of daily life — just left. It’s like they walked out one day, and didn’t come back. The doorway you can see at the very right-hand edge leads to a sunroom/porch that is completely falling apart and falling away from the house. They plan to remove it and rebuild it. It leads outdoors to a wonderful patio area that has a firepit and a stone fountain and all sorts of wonderful things. Love! To the right of that doorway, is the butler’s kitchen — so very awesome — and a back staircase that leads upstairs so that the servants didn’t have to come around and use the main staircase. There are some built-in pantry shelves in the kitchen. I can hardly wait to see how it turns out when they’re finished! The main stairway . . . more fancy woodwork. From the top of the main staircase looking down. You gotta love that keyhole window! Looking straight across while standing at the top of the main staircase. 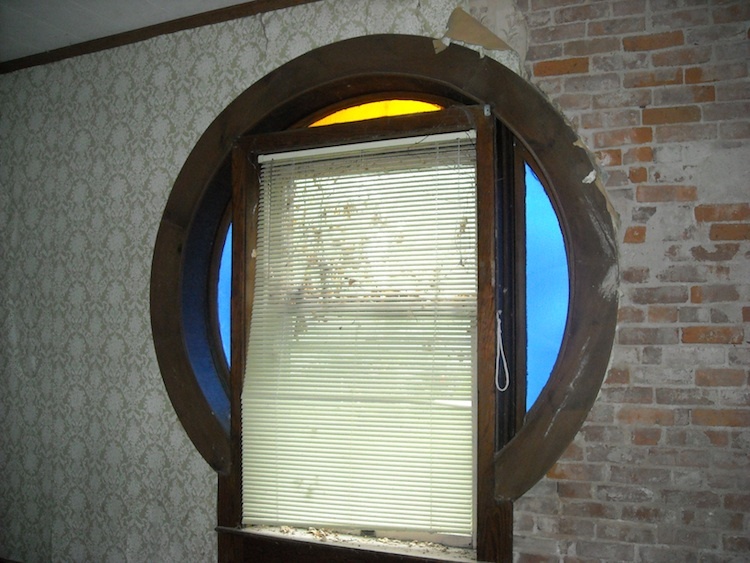 More fancy woodwork and a porthole window. Look at the ceiling falling down . . . yucky. And I can’t say I’m in love with that paneling, either. 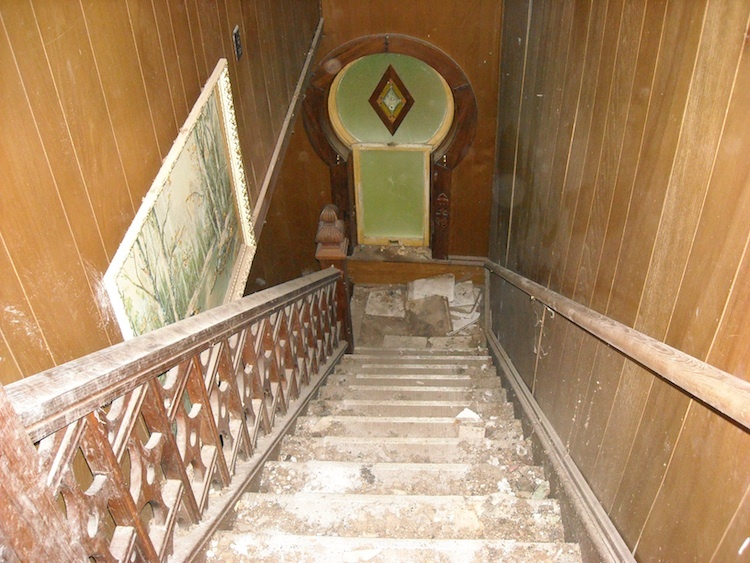 Fortunately, the stairs are covered with some sort of old linoleum, so the woodwork should be kept safe from damage until they’re ready to refinish it. The corner upstairs bedroom. 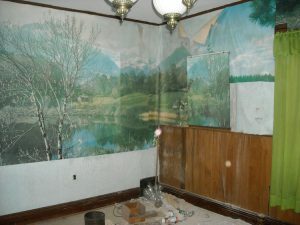 Everyone wants this mural-type wallpaper, I just know it. Looking out from this bedroom. The door angles into the hallway . . . so neat. There’s another bedroom to the left that I didn’t take a picture of. 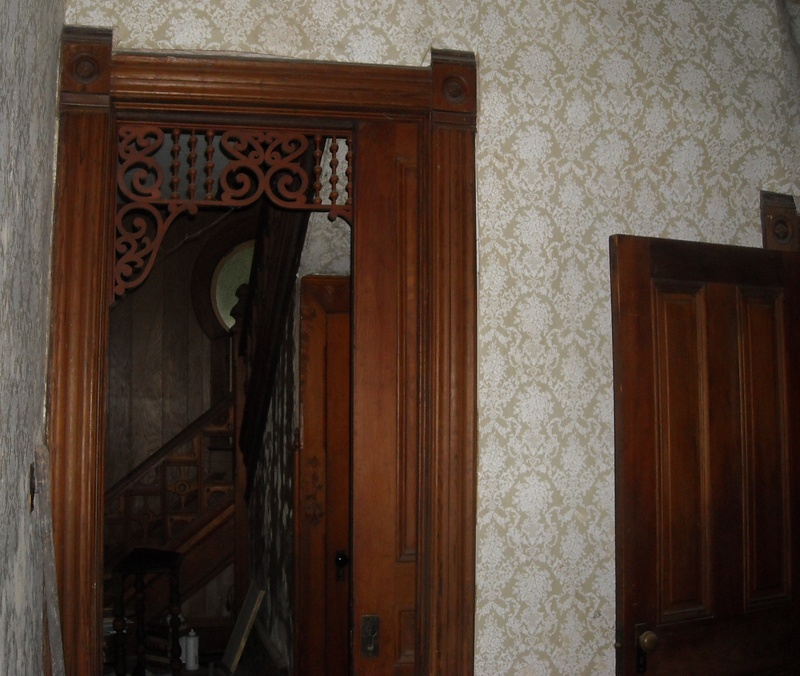 Here’s the bedroom directly across from the top of the staircase. See how they just left everything behind? Clothes, books, everything . 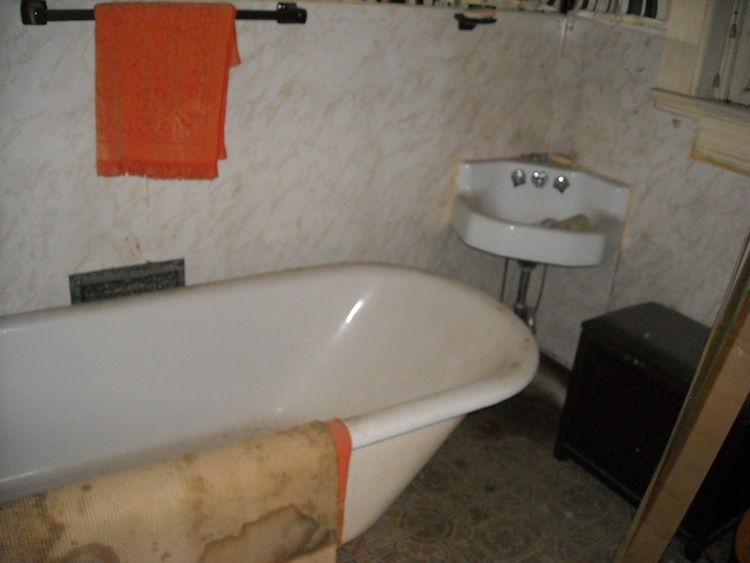 . . and now it’s all filthy, musty, and disgusting from having been left to sit and rot. One thing my sister and I found amusing, is . . . there’s not a stitch of carpeting in the entire house, yet there’s a vacuum cleaner in every room! The main upstairs bedroom. This one sits directly above the dining room, so it, too, has the huge bay window. Every bedroom also has a nice closet — unexpected, but wonderful. Another astonishing thing about the house is that none of the original woodwork was ever painted over — what a blessing that will be for their restoration efforts. 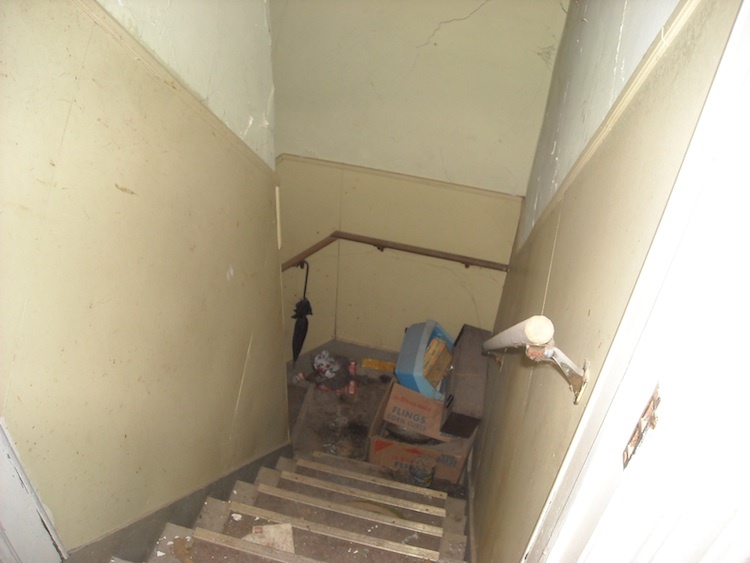 The servants staircase, looking down. It turns to the left and goes into the butler’s kitchen below. Filled with garbage and filth. 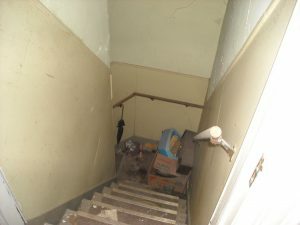 The staircase that goes up to the attic. 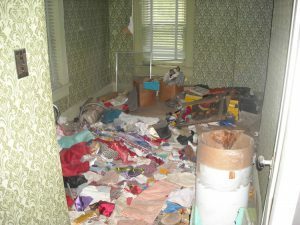 Krista says there’s some neat stuff in the attic that she intends to bring down, some of which she will use in the house. The upstairs bathroom. I see they left a towel for guests to use! I love that corner sink, and the old clawfoot tub. You can’t see it, but there’s striped wallpaper above the towel bar — it’s actually sorta neat. Another upstairs bedroom. This one is L-shaped, and this is its “before” picture. Looking into the “L” — love the corner windows. This room is the main reason my sister and I were here on this day. 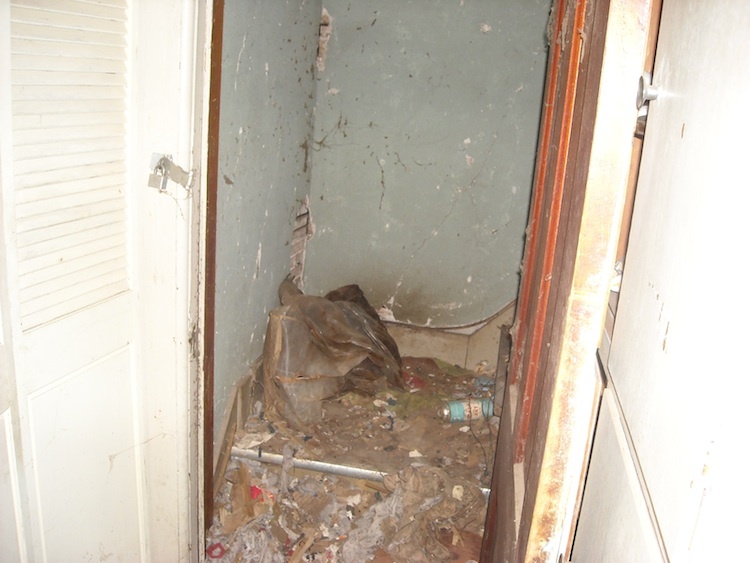 This room was obviously used as a sewing and craft room for the residents, and Krista wanted us to come go through it all to see if any of it was salvageable. Below are the after pictures . . .
We left behind the things we thought Krista needed to see and make up her own mind about keeping. We filled FIVE massive garbage bags with trash, and we got one garbage bag and one box full of things we thought might be useable. And we found this. 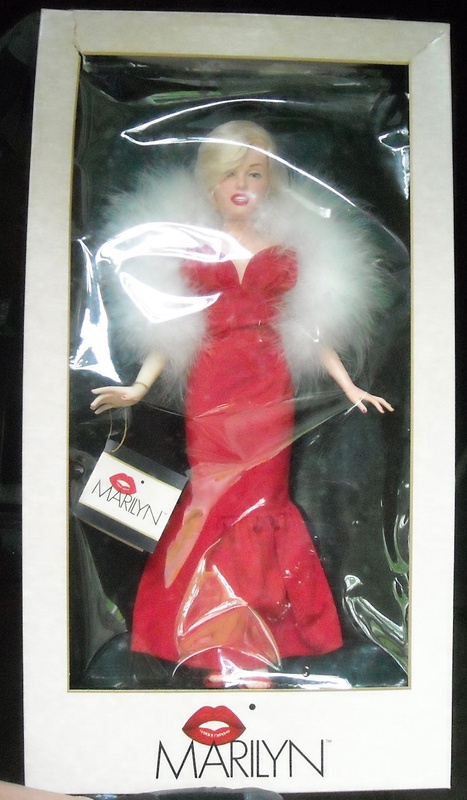 A Marilyn Monroe doll, in pristine condition, still in the box. Dated 1983. Krista was excited! My sister and I divided up the haul we kept, and here’s some of my part. Fabric, some stamped quilt blocks (intended for use with Artex paints, but I’ll embroider them), lots of trims, a partial pieced quilt block, some vintage aprons, and a pile of old handkerchiefs . 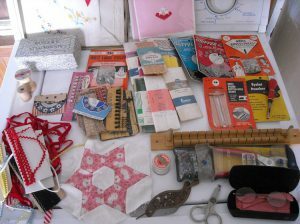 . .
New trims, some still packaged, tools, notions, an old pair of eyeglasses, just some really neat old stuff. I’m working on cleaning it all up to see what will be worth keeping. I’m so excited to see how this place turns out when they’re done working on it. I thought My Cowboy and I had taken on a project with our old 2-story house, but it’s nothing compared to the project these kids have just taken on. Good thing they’re a lot younger than we are! 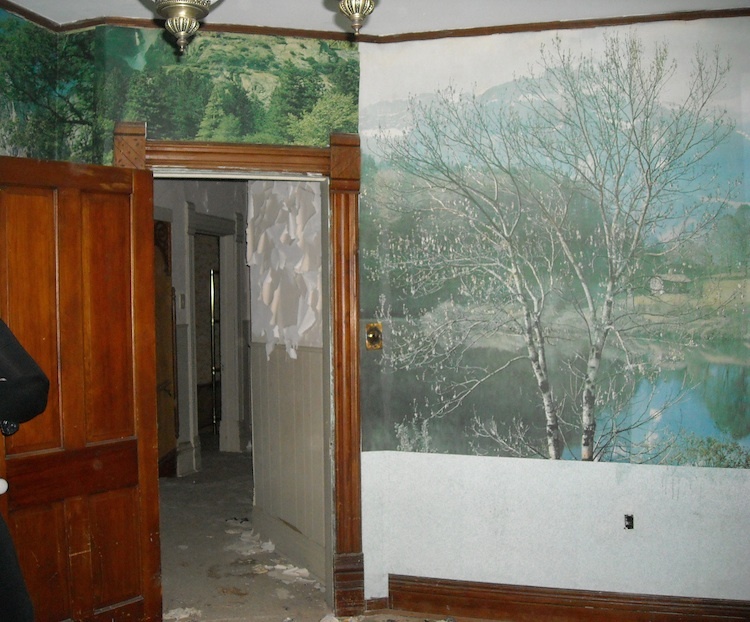 Someday, when they’re done, and I’m about to enter the nursing home, maybe I can take you on another tour to see it restored to its former glory. oh my heavens this place will be GORGEOUS when it’s done!! And if she sees a few ghosts haunting the hallways, tell her to hand them needle and thread and put them to work!! I’m so glad you took pictures. I always wondered about the inside of that house. My aunt lived two doors down. That will be gorgeous when they are done with it. That is odd about the vacuum cleaners. 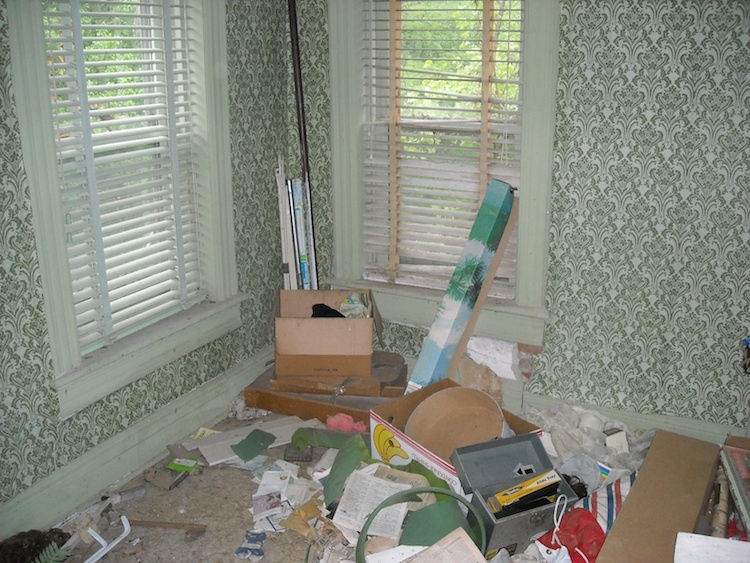 Wouldn’t you have loved to see the house with the furniture they took out and sold?!?! I lived across the street. Had roll out area rugs in most the rooms. 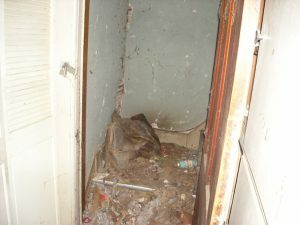 left so trashed out ~ I am excited for the new owners and what they will do for such a beautiful home. Good Luck to them. When I saw the L-Shaped bedroom, I gasped and said aloud, “that’s fabric on the floor!” LOL! 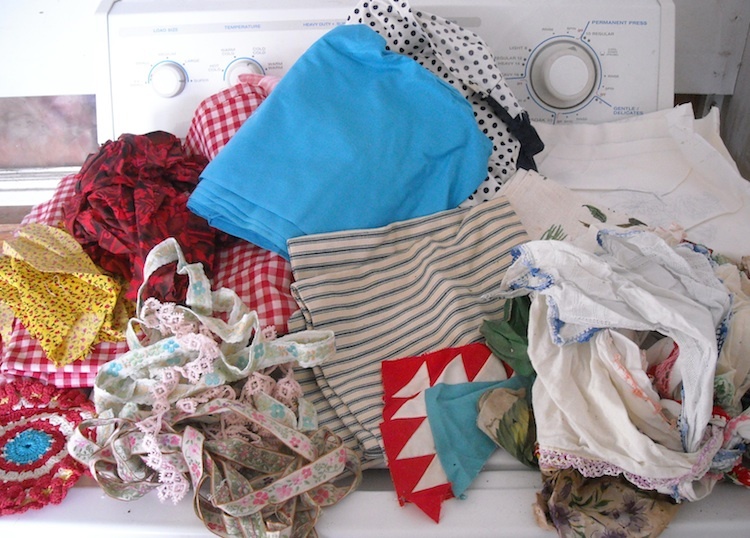 Glad you salvaged some goodies! I love places like this, and I am just crazy enough to take this sort of project on. Luckily Frank has a little more sense than I do. 😉 SO HAPPY to know whenever someone takes this kind of project on, that an old lovely home/building will receive the TLC it deserves! I’m with Doris – I would have taken on that project too!!! I would want to spend every waking minute working on it!! That is fantastically awesome! Thank you for the tour. Always impressed when a young couple takes on a major restoration. Oh my goodness, how fun would that be to refurnish that home. I would love to do that. Can’t believe all the beautiful woodwork had not been painted. That’s fantastic. Keep us posted on the progession of the house. Love the tour! I think you got some good “stuff” out of there. Fun! Thanks for posting! I love these old houses and am glad this one is going to be restored. I grew up 3 houses down from this house. I remember a man named Mike used to “escape” from there when it was LaSalle’s Nursing Home. Mom would call up and tell them Mike was at the end of the sidewalk. I also remember a nurse would come a few evenings a week. If I was lucky she would bring her daughter and I got to play with her. I have never been in that house, but always thought it was such a huge piece of history on Bloomington Street, I couldn’t imagine it not being there. I’m very happy the new owners are going to make her shine!!!!! I am so happy to see this house restored. I was in it many times. I remember when the Joe Cross family lived there and then when it was a nursing home, my great uncle was there and we went to see him. Also when Marie LaSalle was living there alone she would call me at the Bait House (that I owned) sometimes and ask me if I could bring her some milk or bread or something on my way home. of course, the furniture was in there at that time and it was fantastic. Thank you so much for sharing! I walk by this house several times a week & I have always wondered what the inside looked like. Great house! 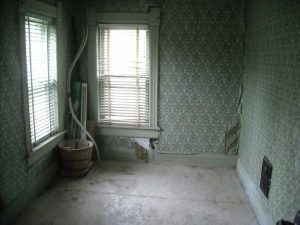 We had one in Georgia that had many of the same characteristics–fireplace, trim, fireplace, needing work…It was our first married-life home and I imagine part of me will always miss it. I have lived in Bevier all my “80+ yrs.” and have been in the house when Joe & Lilly Cross lived in it before Mrs. LaSalle got it and was in it when she had it as a Boarding Home. Always thought it was terrible to let this place go so long, so happy that it will be restored! Looks like there will be a lot of work to be done. Hope when it is all finished I will be able to come see it in “all’s it’s glory”! I use to walk by this house everyday to school I always wanted to see inside. I love this house and can’t wait to see the inside when it is done. So glad it is getting the love it needs. Thanks for posting! I grew up in Bevier, with one of my best friends living next door, and I’ve always been intrigued by it, hidden in the brush. So glad to be able to “see” it now! Can’t wait to see what it looks like when they fix her up! My Mother-in-law was there and the LaSalles were such a caring couple, they restored all that oak woodwork by hand before opening it as a nursing home. 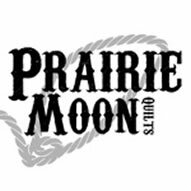 My daughter worked for them one summer during her high school years. when i was little, and marie was still alive, my dad used to mow the yard.. i was never past the front door when i was a child but was always facinated with the house and my imagination would go wild trying to figure out what everyroom looked like inside… i would love a tour when it is all restored! 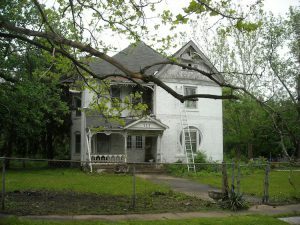 am so happy to see this house being restored and updated and it not continueing to fall apart!! It makes me so happy that the place will be brought back to life. I was afraid the woodwork was gone. So glad is isn’t. I got to see the inside of the house once when Marie still lived there. as a young boy i would stop and visit with marie we would sit at the back porch and watch birds and eat watermelon i never was up stairs but i have a picture of me standing next to a beautiful white christmas tree. 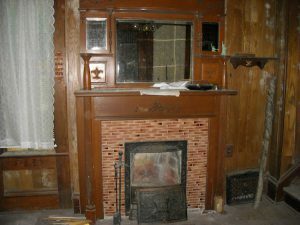 the wood work in the house was amazing even as a child i was amazed by it. i have watched it decay for the last several years now and wished i had the money 2 by it. its a real peace of history for bevier and im glad it finally getting restored !!!!!!! My late husband Dave and I lived in Bevier for several years, and at one time gave serious thought to buying this place. One look through the windows though , and he decided against it. I remember when we moved to Bevier in 1978, the place was gorgeous outside, I was never inside it. It will be beautiful when it’s done, and a labor of love for sure. Wow what a wonderful experience i hope she plans to restore and live in it. 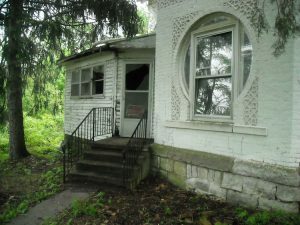 I grew up in Bevier and my grandfather resided in the nursing home until he died (in that house). If you see a Ghost missing 1 eye (from a saw mill accident, named Frank.) Give him a kiss for me. It is a wonderful piece of history. Please give another tour after restoration. I also lived not far from this house…For many years we used to walk by it every day on our way to school. Would love to see pictures during and after the renovation. This makes my heart hurt. Not that your sister is going to restore it, I think that is beautiful!! just that it got in that shape. My Aunt Naomi use to work for Marie. She would go sit with the people over night. We also use to pick gooseberries there somewhere….lol. 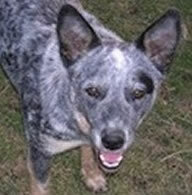 Thanks for posting the pictures, I am sure I will go back and look at them several times. Wow!! Thanks for taking us inside! Congrats on the purchase, Krista! Can’t wait to see it after restoration! I was raised in Bevier and always loved that old house. I lived one block from it for a long time, and at one time asked about buying it. I was told it wasn’t for sale. So glad someone is going to save it. If she needs help I can volenteer a day now and then, just to be a help in saving it. I reupholster and artfully redesign furniture, and would love to help you find pieces that would work in your new place. Thanks so much for sharing these pictures; looks like an exciting experience. Check out Rentschler Redesign on Facebook. Best of luck! My grandmother was there in the 60’s when it was a nursing home. 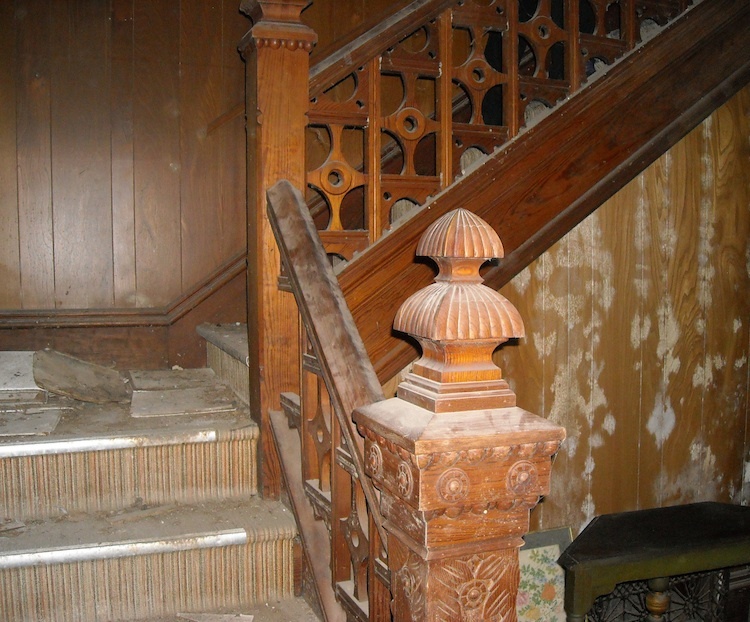 I’m sure that’s the one, I recognize the knewel post on the stairs. So happy someone has bought it and is going to restore it. I will be making a special trip to NE MO to see the progress, hopefully this summer! 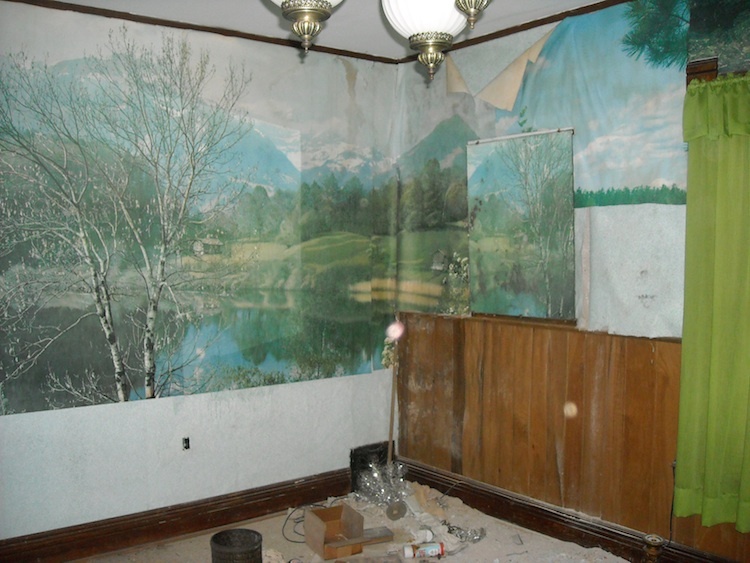 When I was way younger, Mom used to take us to this fascinating home several times a year. We would bring treats, candies, baked goods etc. to the residents. It was really nice then and looks like it will shine once again! Good Luck in your journey taking this beauty to an even higher glory. That is really neat. I love that house. I have always admired people who take on a project like that. I have always thought it would be fun. 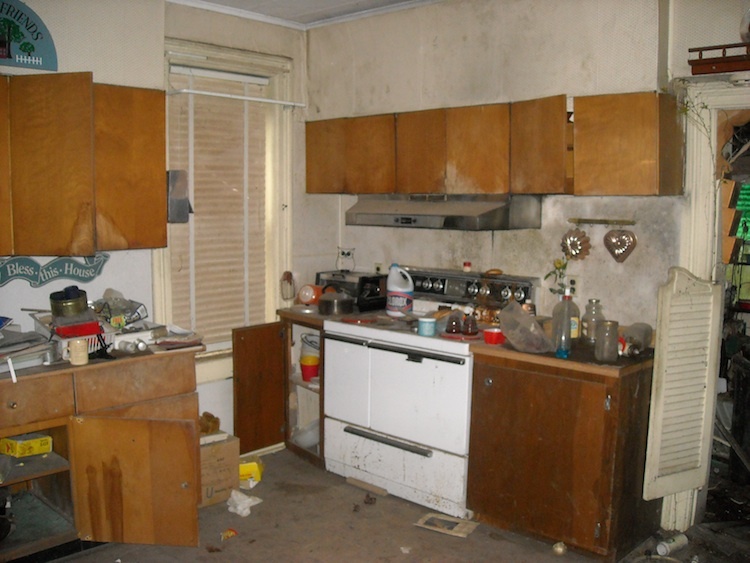 But tell you, we’ve done so much remodeling over time, I’m really kind of tired of it at this point. The next house I get will be a new house! 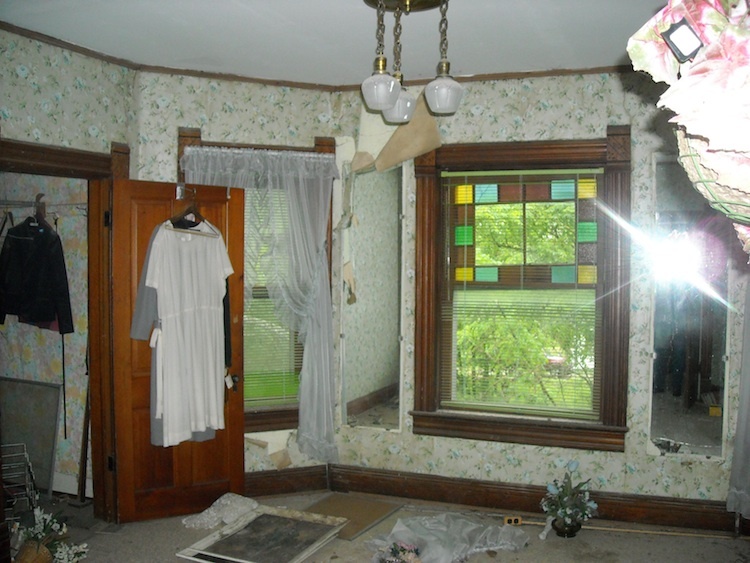 I have always wanted to see inside of this house…thanks so much for sharing. I’m so glad you showed the pics… My family is from Bevier and my brother mowed the yard back in the 1970 and 1980’s. so glad they are fixing it up, are they going to live in it? 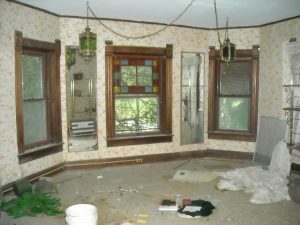 I am a huge fan of saving old homes. The woodwork is wonderful. I sure would appreciate it if you would show some photos of the progress. Can’t you imagine how lovely the house will look when it is done. I read about this LaSalle Boarding House in The Home Press from LaPlata, Mo. 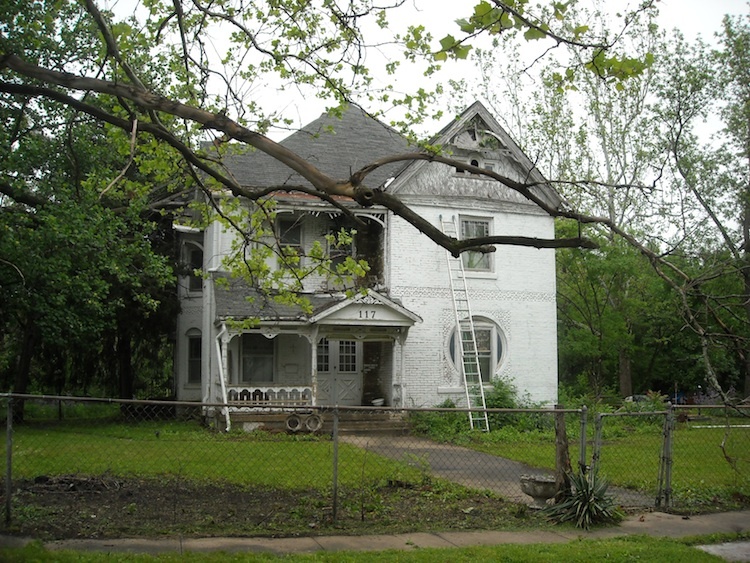 I would love to see pictures of the progress of restoring this once beautiful old house. I read about the LaSalle Boarding House in The Home Press of LaPLata, MO. 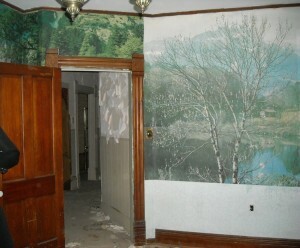 I would love to see pictures posted of the restoration of this once beautiful mansion. Any updates on the progress of this house? Would love to see restoration photos. This house has such beautiful bones. Love all the wood and stained glass windows. Do you know what year this was built and Does anyone have the complete history on it. 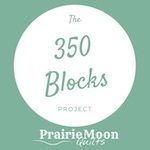 Krista has a blog and she keeps all updates on the house there, here is the website address.. I would like to know if they are still working on it and if so will the have an open house. Marie was my aunt, yes the house was wonderful, I worked for her in the summers.